Chris Dickerson�s career spanned 30 years and included approximately 50 contests. Over the decades, he built a dense and symmetrical physique augmented by a dramatic style of posing. Dickerson earned third place at the 1965 Mr. Long Beach (California), his first contest; he placed fourth at the 1994 IFBB Masters Olympia, his last contest. Two particular achievements stand out in Dickerson�s long career. He became the first African American AAU Mr. America in 1970 and by winning the IFBB Mr. Olympia in 1982, at the age of 43, he became the oldest winner of the sport�s most prestigious title. Chris was inducted into the IFBB Hall of Fame in 2000. 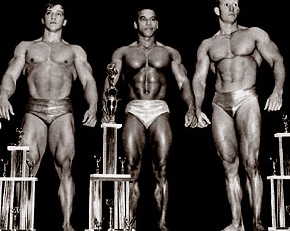 Aiding Dickerson throughout his career was another IFBB Hall of Famer, Bill Pearl. In addition to the 1982 IFBB Mr. Olympia, Dickerson won nine other IFBB pro shows in the late �70s and early �80s, making him one of the most successful competitors of all time. Something of a Renaissance man, Dickerson studied music and is an accomplished opera singer. Widely considered one of the best posers the sport has ever know, his routines were always pure theater. 1982 Mr. Olympia Chris Dickerson's Video!